After the announcement earlier this week of Angela Ahrendts leaving Apple as their head of Retail CEO Tim Cook sent out an internal memo to employees discussing the future of Apple's retail division. In the memo obtained by Business Insider Tim Cook touts that Deidre O'Brien, who would take over as head of retail, has been a part of Apple for 30 years, and was on the original team which developed Apples first Online and Retail stores. Deirdre was part of the team that planned and launched Apple’s very first online and retail stores. She has been a part of Retail’s exciting expansion and every product launch since. 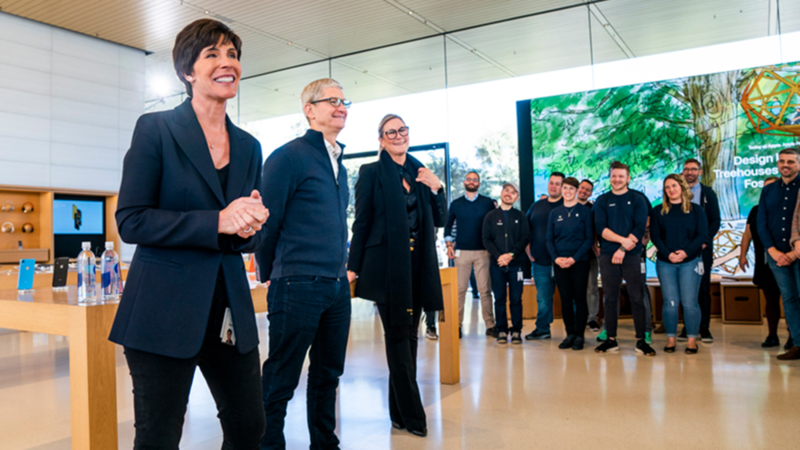 She knows the value of the deep human connections that retail experiences make possible — and she knows this is where Apple shows its heart and soul. As we look forward, finding new ways to elevate our in-store and online experiences, forging deeper relationships with the customers who love our products, I believe that our team, at every level, is the best in the business. I am grateful to Angela for all she’s done for Apple, and I’m looking forward to what Deirdre will bring to her new role ... To everyone in Retail, and our employees worldwide, thanks for all you do to help dreamers become doers, to expand human potential and to do the best work of our lives. Many online have expressed mixed emotions over Ahrendts departure from the company as some see the changes she made to the Apple stores as a negative experience, while others find her involvement to push Apple into the fashion industry to be positive. It will be interesting to see what changes come in the future for the Apple online store and the Apple retail locations, or I mean Apple community spaces.